At the time of writing (February 2015) I feel it’s fair to say that our world is in a swirl of chaos. Environmental degradation is closing in on us. Our financial system is in unethical disarray (greatly in need of a reboot). Surveillance of our every digital move is supposedly commonplace (thanks Snowden for heads up). The powers to be (or want to be), in various regions, go back and forth trying to out do each other with sick displays of atrocity and mayhem. It’s enough to make a sensitive soul want to stay under the covers – or at least pull out the classic change models in order to reassure that its ok to get out of bed — in fact it is imperative! How do we balance the need to look at what is going on in the world (and in our own lives) with the need to remain optimistic and empowered? Well, according to chaos theory stressing the system will bump it to a higher level of order. So one can only hope that the current level of stress our poor dear world is currently experiencing is a sign that she’s about to pop through to a new, higher level. 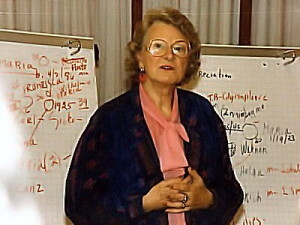 Virginia Satir … with flipcharts! There are a load of change models I can pull out; Lewin, Kotter, Beck to name a few. I like Satir, as in Virginia Satir, famous family therapist. Cause a successful family therapist has gotta know a thing or two about conflict and chaos and how to get through it right?! 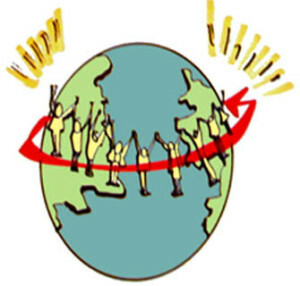 And Satir’s model works at all the levels of system: individual, group, organizational, societal and global. And, it not overly complicated. Its got a simple architecture that is easy to follow and one we can recognize at work in our own life and the many shifts we have each made over the years. 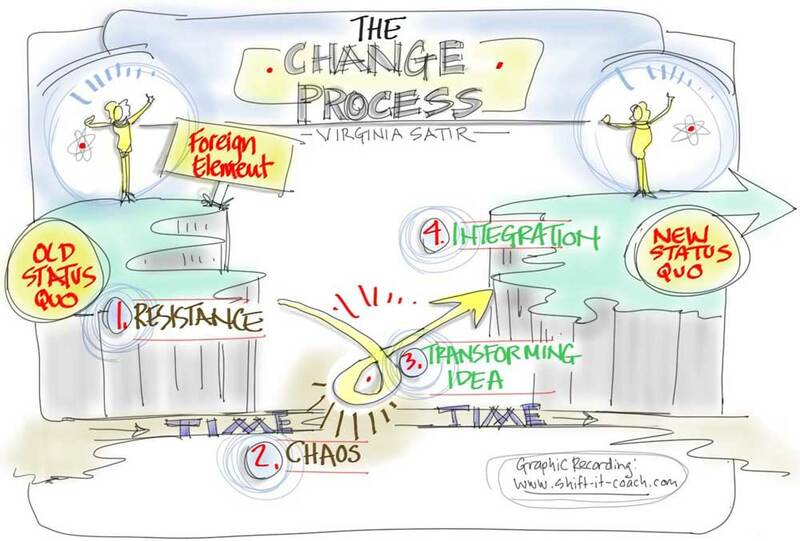 Let me orient you to Satir’s Change Model … via my map above. The model outlines the shift from old status quo to new status quo, via the introduction of a pesky ‘foreign element’ (i.e those alarming global factors I started with). The first stage of the change process (when a foreign element begins to threaten our status quo) is RESISTANCE. This includes pretending our existence is still the same (denial that our status quo is even threatened). Then fighting against any thought or action that smells of having to change or impact the way things have been. Human beings hate change and normally don’t budge without actually having to. Think in your own life … what are you pretending doesn’t exist? What change are you resisting that ultimately you need to make? 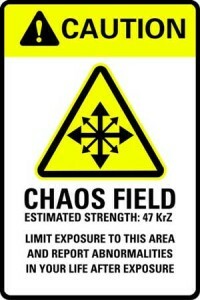 When we finally stop resisting, we are plunged into a cauldron of CHAOS. We know we must change, but we don’t know how and to what. We bop back and forth between considering the options and seeking out various venues to pursue. Our heads (and hearts) ache from the confusion. We don’t know which way is up. In your life, what are you confused about? What are you going here and there trying to figure out, that makes your head spin? We move out of chaos when we galvanize onto a TRANSFORMING IDEA. Something that gives us hope and that we can rally behind (in my world with the organizational and individual change that I help shepard, this is all about DESIRED VISION). If you are there yet … what is the glowing idea or thought that has popped into your consciousness? What are you getting keen, interested and curious about? What is your heart pointing you towards? Now begins the INTEGRATION process … the journey of manifesting that idea into reality. Going through the challenging inner and outer work required to shift worlds. Eventually, through time and effort, solidifying into a new Status Quo. What transforming idea are you in the process of integrating? What are you having to digest? What change in your old status quo is about to or bearing hard won fruit? What new status quo is peaking into view?! The change model always makes me feel better even if I’m in the depths of chaos having no clue about what comes next. Eventually, if I remember to breathe, the transforming idea eventually comes. That gorgeous, glowing, good feeling INSPIRATION. Please join me in feeling, even if we can’t quite make out the details yet, the transforming idea(s) that will bust into our individual and collective worlds eventually resulting into a new, better status quo for us all. Each of us has a part to play. Each of us has our own puzzle piece of inspiration that fits into a collective mosaic. Please integrate the inspiration you receive (your transforming idea) and do your part in this amazing shift we must successful carry off. It’s time to change this kooky old status quo of ours, don’t ya think/feel! P.S. SHIFT-IT Online or The SHIFT-IT Home Retreat Kit are awesome tools to clarify your transforming idea and build your new, better status quo … or work privately with me or one of our Certified Visual Coaches. Also, learn Graphic Recording, Graphic Facilitation and Graphic Coaching skills to visually enhance helping groups and individuals shift.